We broke our narrative here for the simple reason that the history of Siam broke here. Krung Sri Ayudhya was seacked ! in 1767, after holding out against a seige for over a year, Krung Sri Ayudhya fell to the Burmese. The city was totally destroyed. Siamese art and treasures were pillaged. Thousands of people were taken back to Burma as hostages including descendants of Sheikh Ahmad Qomi, and as already mentioned during the sacking and burning, the archives and ancient scriptures were destroyed. It would have appeared to all that it was the end of the line for the descendants of Sheikh Ahmad Qomi to be of any further service to any future Kings of Siam. Our story is not over, however, for there emerged, during this crucial period, a general who insured the continuation of Siamese history. His name was Phya Taksin. He defeated the Burmese and assumed Royal Power as King Taksin the Great of Dhonburi - for that is where he established his Capital. And who were his classmates earlier in his life at Wat Gossawart in Ayudhya? Why no other that Bunnag and the two brothers Boonma and Thong Duang. The latter to be most instrumental in the rise of power of Bunnag. Although in these early days Sin (King Taksin) never got along with Bunnag. He did get along quite well with Thong Duang and Thong Duang's brother Boonma. Nevertheless the two brothers were always close friends of Bunnag. When Sin was proclaimed King Taksin the Great, Thong Duang became his right hand man. 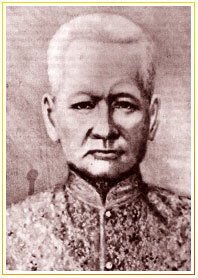 At first Thong Duang received the title of Phya Ronarith, then Phya Yomaraj and later on when he became General of the Army, he was given the title of Chao Phya Chakri, and towards then end of the reign of King Taksin the Great he was created Somdej Chao Phya Maha Krasatsuk and very soon destined to become King Somdej Phra Buddhayodfah, Rama I ! On Boonma, his younger brother, King Taksin bestowed the title of Phya Rajawangsan, Admiral of the Fleet. Later on he received the title of Chao Phya Surasri Pitsawaraj and in the reign of King Rama I (Thong Duang) he became H.R.H. Prince Kromma Phra Rajawang Boworn Maha Sura Singharaj. In 1803, through his brilliant amphibious campaigns, taking his armies through rivers over vales and dales he outmanoeuvred and defeated the Burmese army in the North of Siam. Since then the Burmese never again fought against the Siamese. We are however getting too far ahead of our story. Much earlier Bunnag had taken up residence in Petchaburi. Later on, he became Chao Phya Chakri's (Thong Duang) solicitor and looked after his estates and interests. So well did Bunnag take care of the personal affairs of Chao Phya Chakri, that Chao Phya Chakri accepted Bunnag into his family via the marriage of his wife's sister Nual to Bunnag. This marriage was shortly to propel Bunnag into the Royal family. We digress for an anecdote on how Bunnag and Nual got together. It is taken from a book entitled "The Family Skeleton" by Mom Rajawongse Kukrit Pramoj. It happened in King Taksin Sin's period. 'When Chao Phya Chakri's (Thong Duang) wife, Khoon Nark was waiting on the ground floor terrace to welcome her husband just back from a campaign her sister Nual was looking after Nark's son Chim who had her back to the gate, and her sister sitting behind her. Chao Phya Chakri seeing Nual sitting with his son in her arms, slyly put his hand over Nual shoulder, at once his wife cried out. "What are you doing?" She had anticipated that her husband was touching Nual's breasts. Chao Khun replied, "I'm only touching my son's cheeks". He got away with his excuse, as his wife noticed that Nual's breast and the boy's cheek was on the same level.